Madrid, 1991. When 15 year old Veronica (Sandra Escacena) and her two friends experiment with an Ouija board during a solar eclipse, they have no idea who they are communicating with or what evil they have let loose. Following its Netflix release, Conjuring-style tale, Veronica, was quickly labeled as the scariest movie of the year. With Rec’s Paco Plaza at the helm, you certainly wouldn’t bet against this being the case. 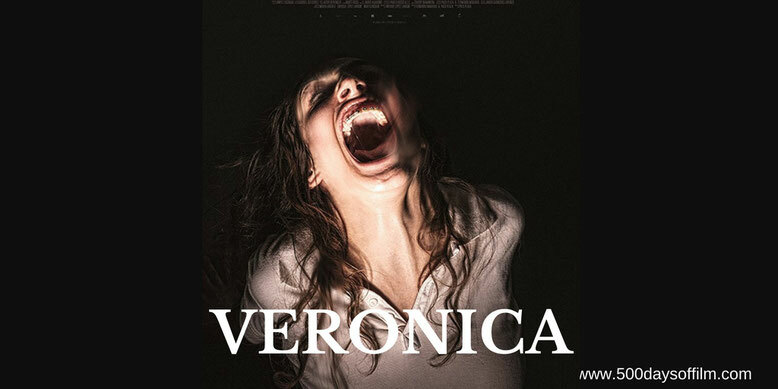 Very (very) loosely based on a true story, Veronica is an effective little horror with a smattering of jump scares and well-earned chills. Yet, while I enjoyed Plaza’s film very much, I didn’t find it particularly scary. However, I am a seasoned horror fan and fear that I have become irreparably desensitised. Plaza understands that horror movies work best when we care about the characters involved. As a result, he takes time in introducing us to Veronica and is careful to keep his story focused on her experiences. The film’s success, therefore, rests almost entirely upon the shoulders of Sandra Escacena. Fortunately, she is more than up to the challenge. Escacena is superb - portraying Veronica’s vulnerability and her fear - all the while making us wonder if the evil is only in her mind. Following the death of her father, Veronica is responsible for her three younger siblings - two sisters and a brother - while her mother (played by Ana Torrent) works all hours in a nearby bar. We sense Veronica’s overwhelming loneliness and understand why she would wish to contact her father via the Ouija board. With this set-up, Plaza then explores several traditional horror tropes - including vulnerable kids, creepy nuns, strange happenings and possession. It is nothing that we haven’t seen before but it is, nonetheless, entertaining. As the film progresses to its inevitable denouement, it is not these tropes (nor the evil shadowy figures) that scare us the most. It is, again thanks to Escacena’s brilliant performance, the battle for Veronica’s soul. Few horror movies land their endings and Veronica doesn't quite fulfill its potential. However, Plaza’s film kept me engaged until the end because I was invested in Veronica and her siblings. After all, the more you care, the more you scare. If you have, what did you think of this film? Let me know by leaving me a comment in the box below or let’s talk horror movies over on Facebook or Twitter (@500DaysOfFilm). Just watched Veronica after reading all the hype and was more than a little disappointed to say the least. Seems that with the exception of The Conjuring there hasn't really been a decent horror movie for years. It was entertaining but hardly scary. Get Out was more frightening due to the basis of the idea, along with an old favourite The Hand that rocks the cradle. If a film bases it's jumps around our fears it always seems to work better; rather then relying on special effects.